CHARLOTTE, N.C. — A North Carolina woman changed her mind about obtaining an abortion last week and instead turned to Christ, quickly becoming convicted in her new life that she and her longtime boyfriend should finally marry and honor God. She explained that J, who has four children with her boyfriend of 11 years, concluded in the midst of difficult circumstances that aborting her latest pregnancy was the answer. She went to a Charlotte-area abortion facility on Monday with plans to end the life of her unborn child. However, upon arrival, J was greeted by volunteers with Cities4Life, who offered free assistance and shared the gospel with her. J changed her mind—in more ways than one. However, J’s boyfriend had a busy work schedule and would be working 12-hour shifts for the next several days. Kaseorg would also be leaving for a week on Saturday. Therefore, it seemed like the wedding would have to wait. Much to her surprise, Kaseorg received a call on Thursday that J’s boyfriend suddenly had the day off due to Internet issues, and they wanted to marry right away. 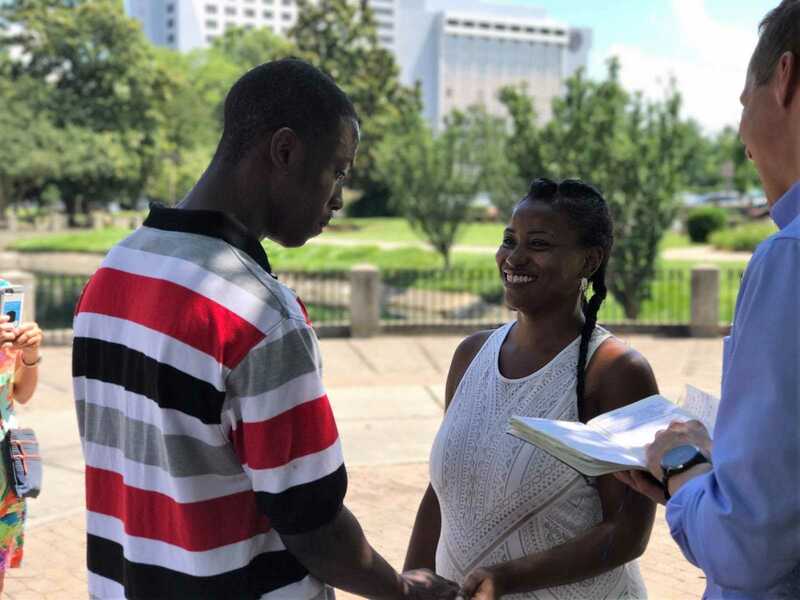 After the two received counseling from the Cities4Life director, Kaseorg took them both to the courthouse to obtain a marriage license, and then went shopping with J to buy a wedding dress. Kaseorg was told that the couple would have to wait until 6 p.m. for a justice of the peace, but even that matter worked out as a pastor who officiates marriages “just happened” to be in town that day and was available. “I told him J’s story, and he said he was honored to be a part of this. He lives an hour or so away, but just happened to be in town which never happens. He could do the wedding at 3 p.m.,” she recalled. J and her boyfriend were then wed that afternoon, and were gifted with a hotel stay by a Cities4Life donor who wanted to bless them in that way. The hotel also provided a free dinner to celebrate the marriage. She encouraged Christians to allow themselves to be used of the Lord, for one never knows what He might have in store for them on that day. Cities4Life will continue to help the couple as they have additional needs at this time.